Corrosion is usually defined as the degradation of metals due to an electrochemical process. The formation of rust on iron, tarnish on silver, and the blue-green patina that develops on copper are all examples of corrosion. The total cost of corrosion in the United States is significant, with estimates in excess of half a trillion dollars a year. These three compounds are responsible for the characteristic blue-green patina seen today. Fortunately, formation of the patina created a protective layer on the surface, preventing further corrosion of the copper skin. The formation of the protective layer is a form of passivation, which is discussed further in a later chapter. 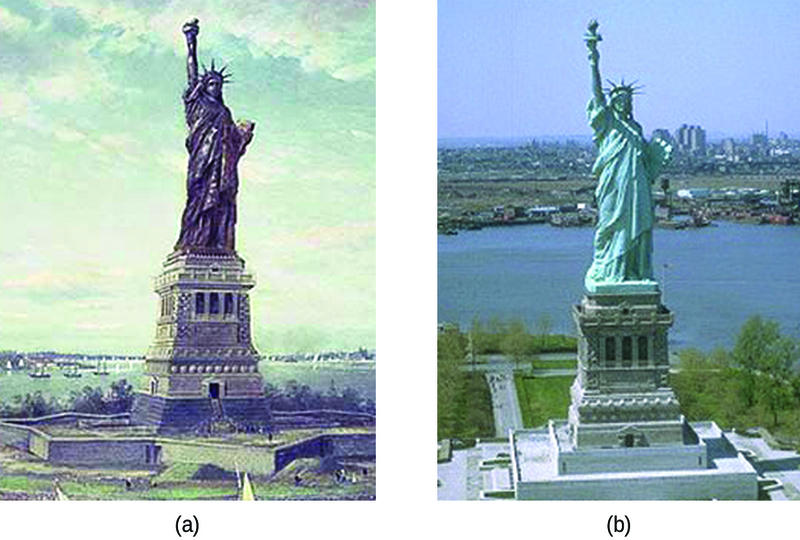 (a) The Statue of Liberty is covered with a copper skin, and was originally brown, as shown in this painting. (b) Exposure to the elements has resulted in the formation of the blue-green patina seen today. Perhaps the most familiar example of corrosion is the formation of rust on iron. Iron will rust when it is exposed to oxygen and water. The main steps in the rusting of iron appear to involve the following ([link]). Once exposed to the atmosphere, iron rapidly oxidizes. The electrons reduce oxygen in the air in acidic solutions. 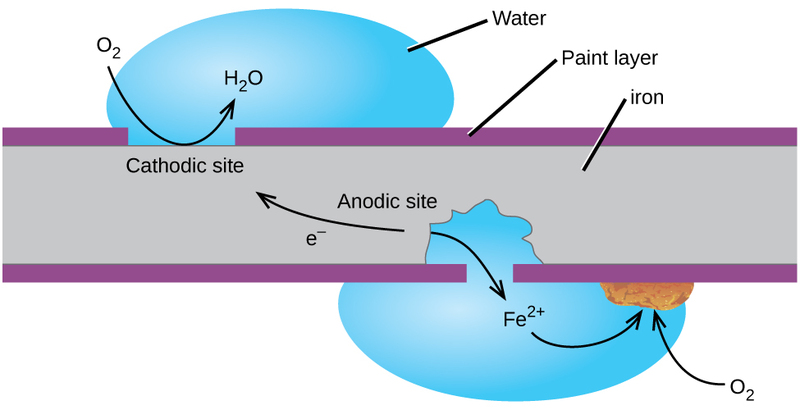 What we call rust is hydrated iron(III) oxide, which forms when iron(II) ions react further with oxygen. The number of water molecules is variable, so it is represented by x. Unlike the patina on copper, the formation of rust does not create a protective layer and so corrosion of the iron continues as the rust flakes off and exposes fresh iron to the atmosphere. Once the paint is scratched on a painted iron surface, corrosion occurs and rust begins to form. The speed of the spontaneous reaction is increased in the presence of electrolytes, such as the sodium chloride used on roads to melt ice and snow or in salt water. One way to keep iron from corroding is to keep it painted. The layer of paint prevents the water and oxygen necessary for rust formation from coming into contact with the iron. As long as the paint remains intact, the iron is protected from corrosion. Other strategies include alloying the iron with other metals. For example, stainless steel is mostly iron with a bit of chromium. The chromium tends to collect near the surface, where it forms an oxide layer that protects the iron. Zinc-plated or galvanized iron uses a different strategy. Zinc is more easily oxidized than iron because zinc has a lower reduction potential. Since zinc has a lower reduction potential, it is a more active metal. Thus, even if the zinc coating is scratched, the zinc will still oxidize before the iron. This suggests that this approach should work with other active metals. Another important way to protect metal is to make it the cathode in a galvanic cell. This is cathodic protection and can be used for metals other than just iron. For example, the rusting of underground iron storage tanks and pipes can be prevented or greatly reduced by connecting them to a more active metal such as zinc or magnesium ([link]). This is also used to protect the metal parts in water heaters. The more active metals (lower reduction potential) are called sacrificial anodes because as they get used up as they corrode (oxidize) at the anode. The metal being protected serves as the cathode, and so does not oxidize (corrode). When the anodes are properly monitored and periodically replaced, the useful lifetime of the iron storage tank can be greatly extended. One way to protect an underground iron storage tank is through cathodic protection. Using an active metal like zinc or magnesium for the anode effectively makes the storage tank the cathode, preventing it from corroding (oxidizing). Corrosion is the degradation of a metal caused by an electrochemical process. Large sums of money are spent each year repairing the effects of, or preventing, corrosion. Some metals, such as aluminum and copper, produce a protective layer when they corrode in air. The thin layer that forms on the surface of the metal prevents oxygen from coming into contact with more of the metal atoms and thus “protects” the remaining metal from further corrosion. Iron corrodes (forms rust) when exposed to water and oxygen. The rust that forms on iron metal flakes off, exposing fresh metal, which also corrodes. One way to prevent, or slow, corrosion is by coating the metal. Coating prevents water and oxygen from contacting the metal. Paint or other coatings will slow corrosion, but they are not effective once scratched. Zinc-plated or galvanized iron exploits the fact that zinc is more likely to oxidize than iron. As long as the coating remains, even if scratched, the zinc will oxidize before the iron. Another method for protecting metals is cathodic protection. In this method, an easily oxidized and inexpensive metal, often zinc or magnesium (the sacrificial anode), is electrically connected to the metal that must be protected. The more active metal is the sacrificial anode, and is the anode in a galvanic cell. The “protected” metal is the cathode, and remains unoxidized. One advantage of cathodic protection is that the sacrificial anode can be monitored and replaced if needed. Which member of each pair of metals is more likely to corrode (oxidize)? Aluminum is more easily oxidized than iron and yet when both are exposed to the environment, untreated aluminum has very good corrosion resistance while the corrosion resistance of untreated iron is poor. Explain this observation. If a sample of iron and a sample of zinc come into contact, the zinc corrodes but the iron does not. If a sample of iron comes into contact with a sample of copper, the iron corrodes but the copper does not. Explain this phenomenon. Both examples involve cathodic protection. The (sacrificial) anode is the metal that corrodes (oxidizes or reacts). In the case of iron (−0.447 V) and zinc (−0.7618 V), zinc has a more negative standard reduction potential and so serves as the anode. In the case of iron and copper (0.34 V), iron has the smaller standard reduction potential and so corrodes (serves as the anode). Suppose you have three different metals, A, B, and C. When metals A and B come into contact, B corrodes and A does not corrode. When metals A and C come into contact, A corrodes and C does not corrode. Based on this information, which metal corrodes and which metal does not corrode when B and C come into contact? Why would a sacrificial anode made of lithium metal be a bad choice despite its which appears to be able to protect all the other metals listed in the standard reduction potential table? Corrosion by OpenStaxCollege is licensed under a Creative Commons Attribution 4.0 International License, except where otherwise noted.